Eaton senior Ava Miller passes the ball, with fellow senior Maley Tinstmanin position to play the ball, during a recent match. Miller has helped the Eagles to a 17-4 record and No. 3 seed in the Lebanon Division II sectional. 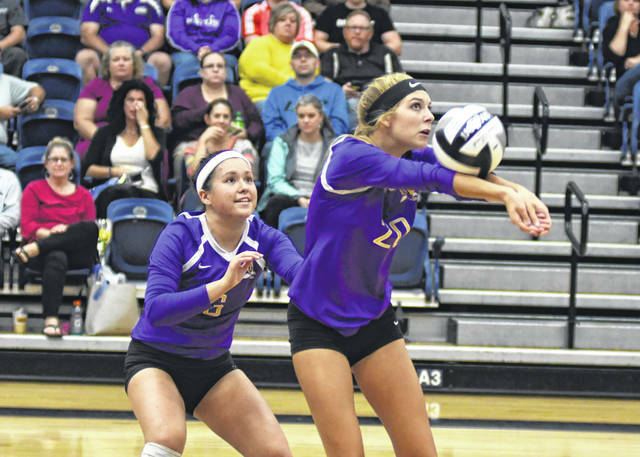 PREBLE COUNTY — The road to the state tournament will begin for county volleyball and boys and girls soccer teams next week. Eaton’s volleyball team landed the No. 3 seed in the 18-team Division II sectional at Lebanon High School. The Eagles (17-4) will take on No. 15 Thurgood Marshall (4-13) in the first round of the Lebanon 1 bracket on Tuesday, Oct. 16. The match is scheduled to begin at 7:30 p.m. The winner will meet Oakwood (7-10) on Saturday, Oct. 20 at 12:30 p.m. In Division III, No. 12 seed Preble Shawnee (8-11) will battle No. 6 West Liberty-Salem on Wednesday, Oct. 17 at 7:30 p.m. In the Brookville 2 sectional. The winner will meet No. 10 Bethel Saturday, Oct. 20 at 2:30 p.m. In Division IV, No. 14 seed Tri-County North (5-12) received a first-round bye and will play either No. 13 Mississinawa Valley (10-10) or No. 9 Mechanicsburg (11-8) on Saturday, Oct. 20 at 12:30 p.m. in the Troy 2 sectional. No. 20 National Trail (6-12) will play No. 8 Emmanuel Christian (15-6) on Tuesday, Oct. 16 at 7:30 p.m. In the Troy 1 sectional. The winner will play No. 12 Troy Christian (11-9) on Oct. 20 at 3:30 p.m.
Twin Valley South (8-11) is the No. 16 seed in the Covington 2 sectional and will play No. 18 Riverside 7-13 on October, 20 at 3:30 p.m. In boys soccer, Eaton (9-2-4) is the No. 4 seed in the Dayton 1 sectional and will host No. 7 Valley View (4-5-5) on Monday, Oct. 15 at 7 p.m. The winner will play either No. 3 Bellbrook (6-5-3) or No. 10 Greenville (2-11-3) on Thursday, Oct. 18 at 7 p.m., at the highest remaining seed. In Division III, No. 27 Preble Shawnee (0-14-1) will travel to No. 8 Greenon (10-2) on Oct. 15, in the Dayton 3 sectional, at 7 p.m. The winner will play No. 14 Brookville (4-9-1) on Oct. 18 at 7 p.m. In the Dayton 4 sectional, No. 19 Tri-County North (4-6) will travel to The Miami Valley School for its first round match up. The game will begin at 5 p.m. The will play No. 15 Dixie (5-6-2) on Oct. 18. In the Dayton 5 sectional, Twin Valley South (3-7-1), the No. 21 seed, will visit No. 17 Jackson Center (6-6-2) on Oct. 18. The game will begin at 5 p.m. In girls soccer, Eaton (6-6-3) is the No. 9 seed in the Division II, Dayton 1 sectional and will host either No. 11 Middletown Madison (6-7-1) or No. 12 Franklin (3-9-2) on Oct. 20 at 7 p.m. In Division III, Twin Valley South (5-4-4) is the No. 17 seed in the Dayton 2 sectional and received a first-round bye. They will play Oct. 20 against either No. 12 Miami Valley (7-5-1) or No. 20 Springfield Northeastern (3-10). Tri-County North (2-9-1) is the No. 24 in the Dayton 3 sectional and will travel to No. 7 Springfield Catholic Central (9-3-1) on Oct. 20. The game is scheduled to begin at 7 p.m. In the Dayton 5 sectional, Preble Shawnee (12-3) is the No. 6 seed and will host Legacy Christian Academy (11-2) on Oct. 20. The match will begin at 7 p.m.
No. 26 National Trail (2-6-1) will travel to No. 13 Botkins (7-4-3) on Tuesday, Oct. 16. The game is scheduled to begin at 5 p.m. The winner will play at No. 5 Troy Christian (12-1) on Oct. 20 at 7 p.m.